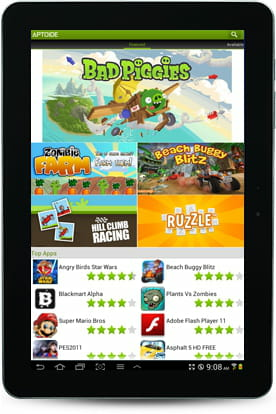 Aptoide is an alternative market from which users can download all Android applications and use them free of charge. At launch, the homepage displays all popular products selected by editors, ranging from games to essential applications; users may also browse to search for a particular application. For updates, all improvements are immediately and automatically displayed on the main interface, giving users the choice to either accept or deny the changes. Paying Aptoide users also have the option to create a shop to sell personal Android applications. Latest update on April 13, 2018 at 04:46 AM.